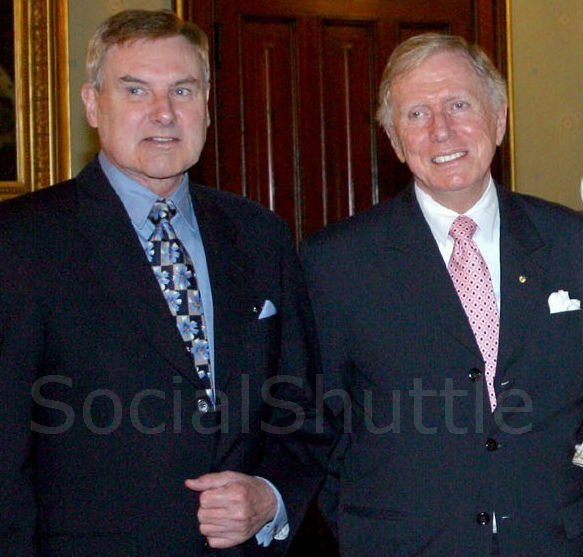 He's been described as a paradox - a conservative monarchist and radical left leaning activist -Justice Michael Kirby, recently retired judge in the highest court of the land. A biography of m'learned judge has just been published with Kirby's backing. The Shuttle has read the book and it's a cracking read. At the launch of the book Kirby described himself as a gay man who is still a 'second class citizen' in Australia. He's been an active supporter for gay marriage rights and often addresses young gays and lesbians speaking out on civil rights. On the High Court he was known as the 'great dissenter' in many cases that changed law. His judgements were regarded as 'liberal while written with thoughtfulness and compassion'. It's said the PM Paul Keating appointed Kirby to the High Court to "upset the Tories"
As a young lawyer just out of Sydney University in the 1960's, Kirby was defending Aboriginal activists and student demonstrators. In one case he took on the defence of 24 students who had been arrested demonstrating for black civil rights in the USA outside the US Embassy. He got everyone off the charges and soon moved onto local civil rights cases. As President of the NSW Court of Appeal Kirby was the first judge to issue media releases and was an advocate for Human rights, animal rights, HIV-AIDS and Aboriginal land rights. ﻿In 1999 Kirby really shocked few when he quietly 'came out' whilst still sitting on the bench of the High Court of Australia, revealing a fact that was common knowledge. In his Who's Who entry he listed his long term male partner as Johan van Vloten, a Dutch newsagent. The outcry from the right wing was deafening. Calls for impeachment came from every angle claiming that Kirby, by announcing he was gay had obviously broken the law when homosexual acts where illegal while he had been sitting as a judge for two decades. Most including numerous journalists seemed to completely overlook the fact that Kirby had simply announced that he was gay and made no mention of sexual acts. And then came the great 'rent boy' scandal when PM John Howard's bovver boy Senator Bill Heffernan announced late one night in Parliament that a High Court judge had mis-used government hire cars to cruise an infamous under age male hustler spot in Sydney. Kirby kept quiet during the fracas while Howard 'suggested' he step aside and that he may call for a Commonwealth Police investigation into Kirby's fitness for office. The great manipulator Howard soon had egg on his face. When the matter was found to be a fraud Heffernan made a sincere and unequivocal apology. Howard demonstrated his innate meanness by remaining silent. Kirby's scalp was one the right wing had been after for ages but he says he wasn't the real victim of the crude scandal, but that the Parliamentary system had been damaged. Kirby said that the long held tradition of Standing Orders in the Westminster system was that sitting judges should be immune from attacks by parliamentarians. Heffernan was censured by the Senate and afterwards apologised for making the allegations. Kirby promptly responded: "I accept Senator Heffernan's apology and reach out my hand in a spirit of reconciliation. I hope my ordeal will show the wrongs that hate of homosexuals can lead to"
Following this gracious acceptance, Who Weekly magazine named Kirby among the 25 Beautiful People of Australia. Kirby however feels aggrieved that his name and Heffernan's are forever linked on Google. Kirby's life has been fascinating and he is a man who is regarded as one of the world's great jurists. You can listen to or download a podcast of an interview with Michael Kirby on the ABC here.